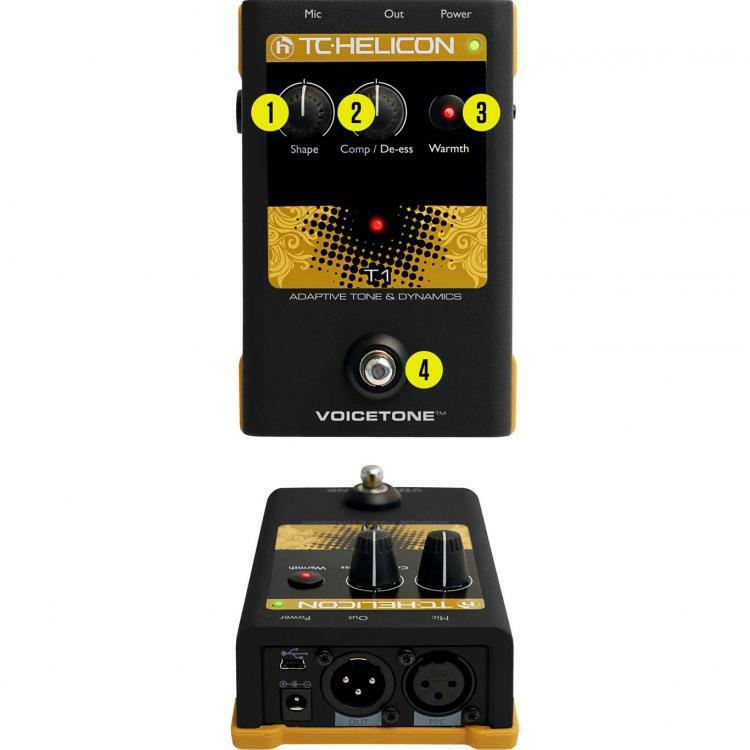 If you were following The Modern Vocalist Journal earlier this year with the debut TMVJ Product Reviews, some of you may recall the review of the TC Helicon D1 VoiceTone pedal. The VoiceTone Singles series feature 7 new single function pedals designed to add professional vocal results and offer maximum flexibility and portability. The are all stoutly built 'stomp boxes' for vocalists that can be linked together in the signal chain with the ability to be controlled via the newly released TC Helicon MP-75 microphone - one I might add TMVJ is slated to review later this fall. More to come. 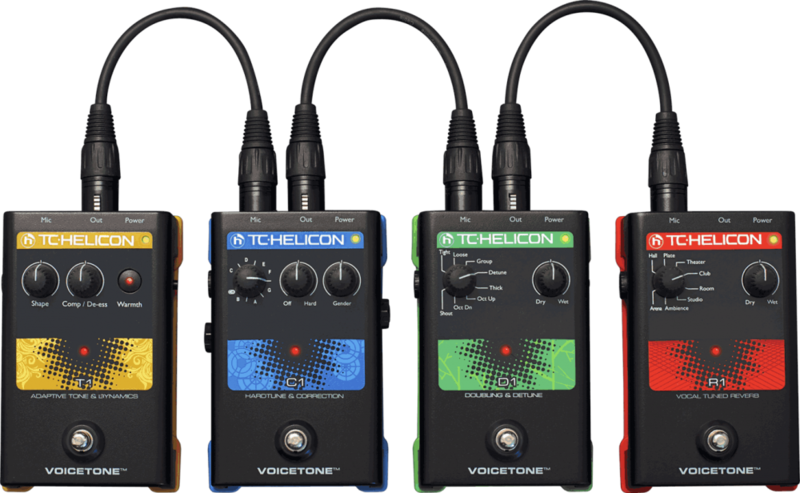 Back to the subject at hand: The TC Helicon VoiceTone T1. Like its singles pedal brethren the VoiceTone T1 utilizes the same durable alloy stomp box form factor. 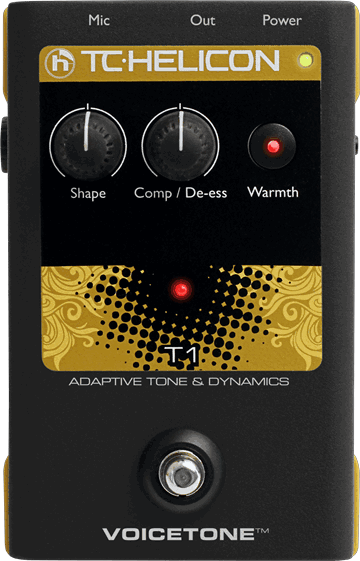 The purpose of the T1 according to TC is to "adapt studio-quality compression, de-ess and EQ to your [sic ] voice". Sounds interesting considering the T1 features a total of 3 adjustment controls. Those consist of rotary "Shape" and "Comp/De-ess" knobs and a "Warmth" in/out switch. Other controls are a main effect stomp switch with on/off led indicator, mic gain control with signal/clip light and Mic-Control off/on switch for MP-75 control. Labeling and layout is up to typical high TCH standards as is the quality of the controls. Each singles pedal features different colored accents to differentiate them. In this case the T1 sports bright yellow accents on black with a grippy matching rubber anti-skid mat. As of this writing the T1 was retailing on GuitarCenter.com for $129.00. Standard XLR in/out are provided along with fairly typical wall-wart power jack. One thing to note is the lack of a phantom power switch. The VoiceTone pedals do in fact have phantom power that is always on. It's an interesting design decision but ultimately I would prefer a micro-switch to disable it. A USB port for setting tweaks and upgrades using the downloadable TC-Helicon VoiceSupport application available on both Win and Mac platforms. While I never believe in writing a review before I live with a piece of gear for a while the VoiceTone T1 is on the high side of long term as I have spent nearly 4 months dealing with it on a regular basis. While mic's were swapped, effects switched in and out the T1 stayed plugged into live signal chain for the better part of that. In fact at times I almost would forget I had it plugged in at all - but not because it doesn't do anything. In a word the T1 is ultimately transparent operating unobtrusively in the signal chain. Right out of the box I left the T1's Shape and Comp/De-ess knobs centered out, Warmth switch in the off setting and plugged it into last link in my signal chain prior to the board using my trusty warm yet slightly boomy EV N/D767A. After performing some test A/B vocal passes using some of my vocal warm up material, I began to get a feel for the T1's sound. While generally speaking I'm not a huge advocate of adding compression and ultimately removing too much of the dynamics in live vocals due to how it can effect how the vocalist sings my ears tell me the average compression ratio of the T1 to be relatively low. With only two knobs, I can only speculate what's actually happening behind the scenes but I found it to actually leave the bulk of the vocals alone while adding a little bit of beef to the low end and providing just a touch of attenuation on some of my higher belts ultimately providing a slightly smoother vocal. After dialing in my sound a bit more I finally settled on the Shape knob around 8 o'clock and Comp/De-ess around 9 with Warmth still in the off position. Generally speaking I did not find the Warmth setting to be entirely necessary in my application as I found it to add in a bit too much muddiness into the vocals however I could see this being useful given a thinner sounding microphone or singer. My vocals also benefited when using the T1 with the full band. The additi onal clarity provided gave a nice bump of extra vocal cut with a bit more sparkle on the top. With the T1 doing the work of adding a bit of compression and EQ I was safely able to bring up the overall levels a few db's giving me a bit more girth on my lower less-powerful register without fear of feedback. While I understand the point of a minimal amount of available controls with which to tweak the sound I found myself at times yearning for a little bit more in the way of tweak-ability. It might be nice to change the compression ratio or enable/disable de-ess for example. At the end of the day the TC-Helicon VoiceTone T1 represents yet another solid offering from the company which has brought us the likes of the VoiceLive and VoiceWorks products. This would be a great addition for those of us looking to add icing to the cake on our already good live vocals. Is it absolutely necessary? No. If you're torn between upgrading to the T1 or upgrading your mic start with improving your primary signal chain first. Once you've got your other bases covered then it comes time to add in the VoiceTone. Given TCH's class-leading reputation for build quality and from my experience so far the VoiceTone T1 is worth checking out for those of you looking for a little something extra. Order TC-Helicon T1 Vocal Tone and Dynamics Ef fect Pedal from The Vocal Gear Store NOW!